The book takes place shortly after Ack-Ack Macaque, where our hero is now in hiding of sorts. His fame from the first book has driven him to piloting a dirigible of some sorts, and things are basically okay until a doppelganger of his programming arrives and takes over. It's up to Ack-Ack Macaque to save the world from his ultra-intelligent monkey twin that is using mind control to enslave the population. As you can tell, the entire idea is extremely convoluted. The story itself isn't necessary, nor was the sequel, but it has its fun moments. Ack-Ack is a genuinely fun character to read (and I assume to write as well), but on a whole, the story just feels almost too light. The first book was good in what it was, and that's fine for what it was trying to do. 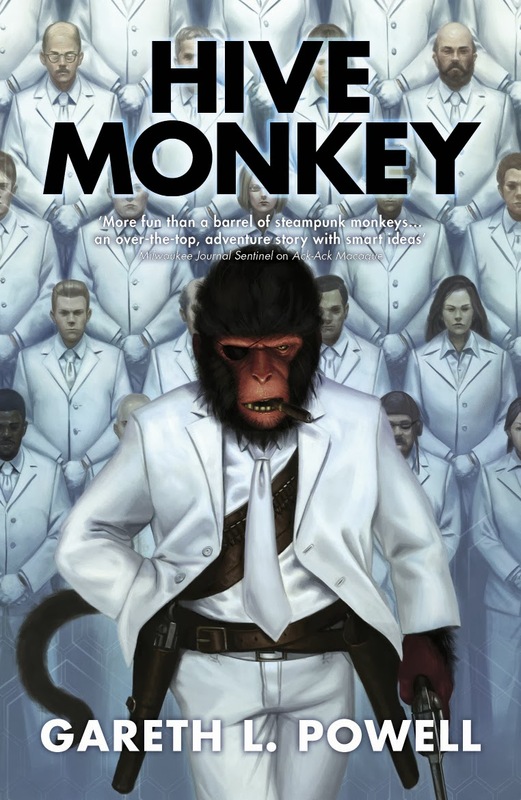 The failings of Hive Monkey come from a different take on the artificial intelligence that doesn't feel like it fits in right combined with a story that seemingly takes forever to get to the point. The scenes with the doppelganger, for what it's worth, are some of the best in the book, making the rest of it that much more frustrating. Overall, a decent, but not spectacular, sequel. I would probably still explore what comes next, but I wouldn't term it very anticipated.